Leib Glantz is considered by many the greatest cantor that ever lived. For 100 years, cantors and musicians throughout the world have recognized his brilliance as a composer, interpreter and cantor, as well as a scholar and teacher of Jewish music. Glantz was the people’s cantor. Crowds all over the world filled the streets anywhere he performed. His many admirers thrilled and wept with emotion at the sound of his voice. His music penetrated souls and inspired young people, many who would later become famous cantors and musicians themselves. The subordination of cantorial art to rabbinic learning was not always the case. 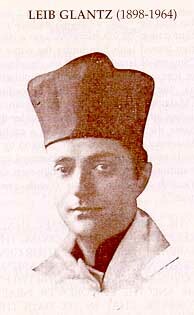 During the Golden Age of Chazanut (cantorial art of the synagogue), in the first half of the twentieth century, cantors were considered superstars among the Jewish people. Today, many cantors eschew traditional Jewish music in favour of popular, modern tunes, combining foreign elements that originally had no place in this traditional cultural art form. This book makes the case for how much is lost with this popularization of ritual.